In 1985, US President Ronald Reagan agreed to visit a cemetery in Bitburg, Germany to lay a wreath in honor of Germany’s war casualties. Reagan’s team of advisors did not do their homework, and it was later discovered that the cemetery contained graves of some of Hitler’s elite officers who had taken part in the massacre of Jews. Here was a president who always talked about “American values”, and he was going to pray for soldiers who had caused the Holocaust. There were strong protests by Jewish groups, US congressmen, US military officials, and regular citizens who all urged Reagan not to make the visit. He felt he could not cancel, however, and instead, a trip to a nearby concentration camp was also scheduled for the day of the cemetery visit. Reagan was not anti-Jewish, nor was he a Nazi sympathizer, and he himself had even served on the “right side” of the war. Although he had simply bumbled into the visit, the “Bitburg Fiasco” turned into one of the lowest points of Reagan’s presidency. He and his handlers had failed to see the powerful symbolism of the visit. The Reagan-Kohl idea of a historic harmony is, therefore, an insult not only to those who suffered and died in the camps. World War II was not just another European war. It was the darkest hour of European civilization. Its end brought to an end the world’s most atrocious regime and the world’s hitherto most dangerous conflict. It also laid the basis for a democratic West Germany and a united West (Lou, 1991). Japanese Prime Minister Shinzo Abe, on 26 January 2013, made his second visit to Yasukuni Shrine, a powerful symbol of Japan’s wartime militarism. Unlike Reagan who had bumbled into his visit, Abe went on purpose. Unlike the Americans, who had fought against the German aggressors, Japan was the aggressor. Unlike many Japanese leaders who deny many wartime actions, the Germans have accepted their Nazi past. Thus, it is understandable that the Koreans and Chinese would be upset by visits to Yasukuni by Abe and other officials. 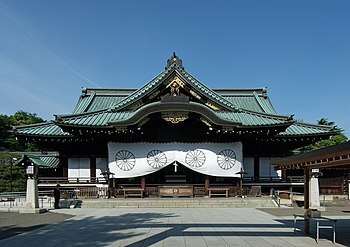 This post explores national identity and visits to Yasukuni Shrine by Japanese government officials. I examine how the visits help to form and strengthen a sense of nationalistic, racist self-identity among some Japanese. I will also show how the visits help to form a particular identity of Koreans today. This paper is based on Benedict Anderson’s (2006) Imagined Communities. Love and self-sacrifice are important parts of a nation’s identity, and Yasukuni is a symbol of that positive side of nationalism and patriotism. Anderson points out that a love of nation is often expressed in its literature. Emperor Hirohito paid a visit to the shrine and wrote a poem that said: “I assure those of you who fought and died for your country that your names will live forever at this shrine in Musashino.” Because of this, soldiers who went to war would say “Let’s meet at Yasukuni.” These words signify loyalty to the emperor, to the nation, and to the Shinto religion. In this way, it was and remains a symbol of love and self-sacrifice. People who believe it is the right or duty of Japanese, even government officials, to pray at Yasukuni argue that it is a spiritual place. To worship at Yasukuni is an act of love and gratitude to those who fought and died for Japan (John, 1991). Many Japanese also believe it is the right of the people of a nation to worship whoever and however they choose to worship. Anderson discusses the roots of racism and says that in some cases it came from social class differences rather than nationalism. But in the case of the Japanese, is it possible that nationalism and racism were pretty much the same thing? Koshino Kosaku is a sociologist who studies Japanese identity. He argues that “racialism” includes racism but is broader in meaning. He describes race as a socially constructed and imagined community because it does not have a real biological foundation, and because most members of the group don’t actually know each other. Although the Japanese are mixed, many of them imagine that they are a racially distinct and homogeneous group. These people believe that being Japanese is an unchosen result of nature. The Meiji leaders invented the idea of Japan as a “family-nation of divine origin.” All Japanese were supposedly related to each other and to the emperor. “Kinship, religion, and race were fused to produce a strong collective sense of oneness” (Koshino, 1998). Next, we will discuss Yasukuni and Korean identity. Whenever a Japanese official visits Yasukuni, the Koreans protest. It seems as Korean nationalism has been strengthened through protest against Japanese policy. Recently, the Korean president refused to negotiate with the Japanese because Japan refuses to apologize for its wartime actions. One Korean said that he can not talk about the history of his country without talking about what Japan did when it controlled Korea from 1910 to 1945. Jouhki says that the Korean image of Japan is as it was in the colonial period, and Yasukuni represents imperial Japan just as if it were now. The image exaggerates the difference between us and them, Korea and Japan. He says that when the Koreans were colonized, it made the Koreans see themselves as “Other”, just as they saw the Japanese as “Other”, and Yasukuni represents an identity that they are still trying to work through. Therefore, Japanese leaders’ nationalism, expressed through visits to Yasukuni Shrine and the museum and textbooks that fail to show wartime atrocities, is not only a means to form a certain Japanese identity. It seems that Japanese nationalism strengthens a certain Korean identity as well. Amartya Sen writes that a sense of identity can be positive because it makes us closer to others in our group, but it can also be negative because it can cause a deep feeling of division with those who are outside your group. He talks about how Al Qaeda tries to create a militant Islamic identity so that the people will feel the West is separate and bad. In the same way, Abe’s visit to Yasukuni creates sense of division from both the side of Japanese and Koreans. The illusion of unique identity is much more divisive than the universe of plural and diverse classifications that characterize the world in which we actually live. The descriptive weakness of choiceless singularity and … the illusion of destiny exacts a remarkably heavy price” (Amartya, 2006). Visits to Yasukuni can cause certain groups, both Japanese and Korean, to get caught up in one identity, forgetting they have diverse identities, and this can lead to conflict. These visits cause some Japanese to identify themselves as Japanese in a nationalist, racist way. They can cause some Koreans to identify themselves as Korean and the former victims of Japanese imperialism in an overly nationalistic way. Clearly, Yasukuni Shrine is a symbol of patriotic love and self-sacrifice. It depends on your political beliefs as to whether you think this is a good thing or a bad thing. I believe the people were used and sent to war by the Meiji oligarchs in their official nationalism, and they need to be prayed for. However, I believe, that we should pray for them in a place that is not so political and insensitive to the Koreans and others. It leads to a nationalist identity, on both sides, that is divisive and may lead to conflict and violence. Benedict, A. (2006). Imagined communities: Reflections on the origin and spread of nationalism. Calhoun, C. (1993). Nationalism and ethnicity. Annual Review of Sociology, 19, 211. 239. John, B. (1991). Yasukuni: the war dead and the struggle for japan’s past. (2007 ed., p. 56). C Hurst & Co Publishers Ltd.
Koshino, K. (1998). Making majorities. (2007 ed., p. 19). C Hurst & Co Publishers Ltd. Some people criticize nationalism because it is connected with racism and a sense of “us & them.” Benedict Anderson, however, believes we should remember that nations also inspire love and self-sacrifice. 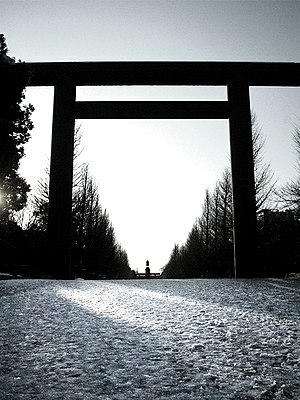 I want to explore how Yasukuni Shrine is seen by some as a symbol of love and self-sacrifice. How do some people see Yasukuni as a symbol of love and self-sacrifice? Anderson points out that a love of nation is often expressed in its literature. Emperor Hirohito paid a visit to the shrine and wrote a poem that said, “I assure those of you who fought and died for your country that your names will live forever at this shrine in Musashino.” Because of this, soldiers who went to war would say, “Let’s meet at Yasukuni.” These words signified loyalty to the emperor, to the nation, and to the Shinto religion. In this way, it was and remains a symbol of love and self-sacrifice. Many Japanese also believe it is the right of the people of a nation to worship whoever and however they chose to worship. Clearly, Yasukuni Shrine is a symbol of patriotic love and self-sacrifice. It depends on your political beliefs as to whether you think this is a good thing or a bad thing. I believe the people were used and sent to war by the Meiji oligarchs in their official nationalism, and they need to be prayed for. I believe, however, that we should pray for them in a place that is not so political and insensitive to the Koreans, Chinese, and others. Breen, John, ed. 2007. Yasukuni, the War Dead and the Struggle for Japan’s Past. New York: Columbia University Press.